Mathematics is primarily concerned with logical deduction and abstraction. The logical deduction aspect helps to think systematically and argue in an irrefutable manner. The abstraction aspect, on the other hand, helps to identify the absolutely essential issues and the inter-relations among them. Both these aspects, logical deduction and abstraction, play an important role in Information Technology also. Therefore first objective of the department of Mathematics is to produce the students with high mathematical thinking in tune with the latest development in information technology. Now a days Mathematics is an integral part in the study of many area such as computer science, communication, cyber security, bio-mechanics and finance etc. Department of Mathematics is also focused to motivate the students towards research and to make aware them importance and increasing needs of mathematics in various areas of science and technology. To achieve these goals, the department maintains the high standard of teaching and research. All faculty members of the department are well qualified with rich academic and research experience. All faculty members are doctorate from the institutes of repute and highly engaged in research in diverse area of basic sciences, engineering and technology. To make aware of the latest developments, the department keeps on timely updating in its teaching and research methodology and introduces new courses, which are aligned with the need to tackle real life challenging problems in science and technology. 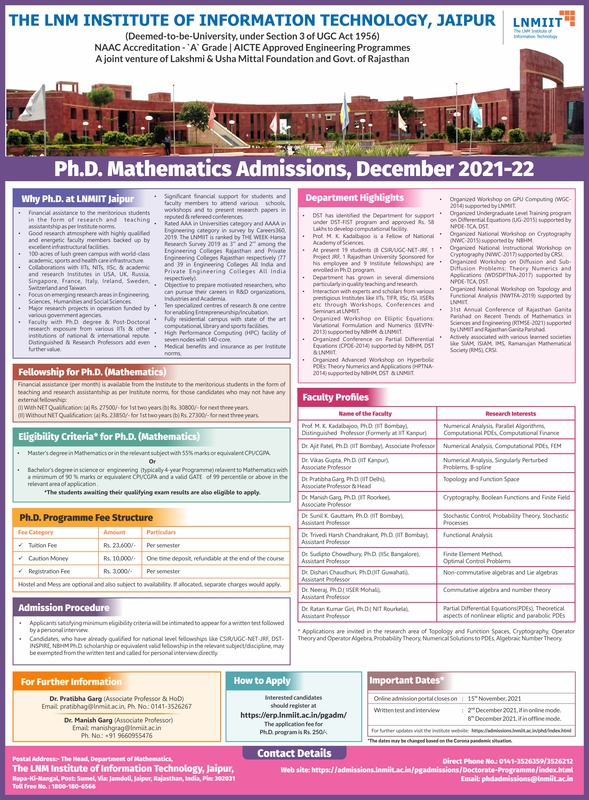 Faculty members of the department are actively associated and contributed to various learned societies like Society of Industrial and Applied Mathematics (SIAM) USA, Indian Society of Industrial and Applied Mathematics (ISIAM), Indian Mathematical Society (IMS), Ramanujan Mathematical Society (RMS).